I’ve always been suspicious when I read a book on the history of Archaeology or attend a lecture that starts with the “Fathers of Archaeology” and never mentions women, at all, ever. I know Archaeology isn’t the only scientific field to suffer from this “man-washing” of its history. I don’t really think it’s a malicious thing, I think women have just been marginalized for so long, even other women in the different fields accept that women had no hand in forming or growing science. The reality couldn’t be further from the truth. Women, being about half of the population, have always contributed to science. Some of them did paperwork, some became scholars and lecturers, some risked their lives in the pursuit of their fields. No contribution was too small. That said, we’ve already covered Mary Anning the famous fossil hunter who provided specimens to the most renowned experts of her time and was considered an authority as well. We’ve also covered Elizabeth Philpot another early fossil expert and dear friend of Anning, who was renowned and respected among her male peers. Now I want to introduce you to a woman who very likely was the handmaiden of modern archaeology, Amelia Edwards. Amelia Edwards got a late start in her career as an advocate and promoter of Egyptology, at least by Victorian standards. Born to a retired army officer and a Irish mother, Amelia was taught from the start to be independent, curious, and fearless. Her mother home schooled her and refused to teach her anything about homemaking. Her mother, Alicia Edwards, apparently didn’t want to domesticate her daughter and instilled a fiercely independent streak in Amelia (Adams 2010:19). Edwards for her part, showed an early talent for art, focusing on pencils and watercolors, and music, making a name for herself playing the Organ. She also showed an early interest for adventure, as she would spend her summer abroad with her mother in the Irish hills and fields climbing over and investigating the ruins of the past (Adams 2010:19). Early on she made a comforatble living for herself as a moderately successful romance writer. She had a comfortable savings when the next phase of her life unfolded before her (Adams 2010:19). At the age of 30, her parents died within weeks of each other, leaving Edwards completely unattached. She’d only entertained marriage once, being engaged to a nice gentlemen she felt no particular affection for. So she called off the engagement and never pursued another. She seemed happy with her lot of being a spinster, and embraced the freedoms of an unattached woman with enthusiasm (Adams 2010:21). Amelia Edwards decided to travel the world after her parents deaths. A decision that would land her in Egypt almost by accident and the ship she was on was seeking shelter from the bad weather. She and her traveling companion, Lucy Renshaw rented what is basically a house boat called a dahabeeyah, the Philae. She reportedly kept it up very nicely with all the luxuries a proper Victorian lady could afford (Adams 2010:23). It was while out on this Egyptian adventure that Edwards flay bloomed into her her life calling. She fell in love with Egypt, and in particularly, Egyptology. She was hungry to make her own discovery, and got her wish. 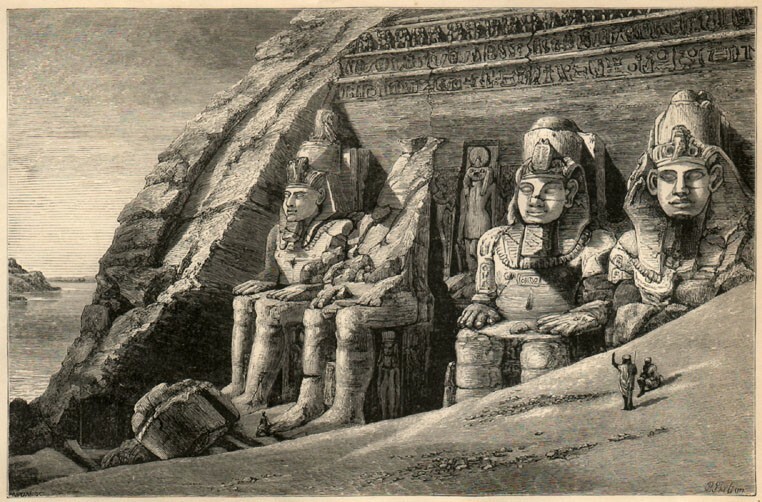 Moored for two weeks at Abu Simbel, she discovered a small square chamber (Lesko). In her excitement of the initial discovery she reportedly fell to her knees beside the small opening and began digging with her bare hands while still in her skirts. Later, hired another 50 local men from the local village to help “excavate”. Soon they were inside the small square room and she and her crew began recording the vividly painting on the walls, and they even found a human skull. Hopes were high that the room would reveal a burial chamber, but instead it seems she found a library or small chapel (Lesko) of sorts with beautifully painted walls (Adams 2010:32). 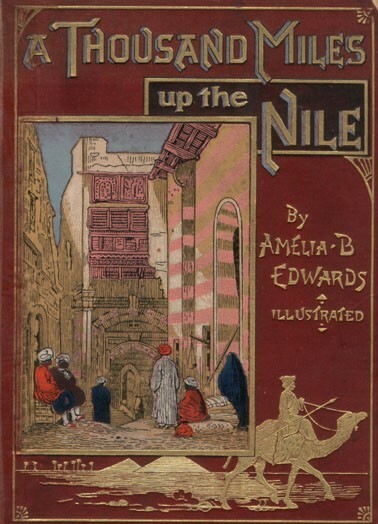 Edwards wrote about her time in Egypt in her wildly successful novel, A Thousand Miles up the Nile – A woman’s journey among the treasures of Ancient Egypt. Amelia Edwards did more than just chronicle her adventures here, she also made a plea to her readers for preservation and careful treatment of the sites in Egypt. She complained about how the delicate painting on the walls of many tombs were smudged and damaged by careless travelers and researchers (Adams 2010:32). Edwards also commented on the Peoples of Egypt. She expressed sympathy for the impoverished fellahin and revealed that she had considerably more understanding of the plights of the local Peoples than would be expected from someone of her background and time (Lesko). 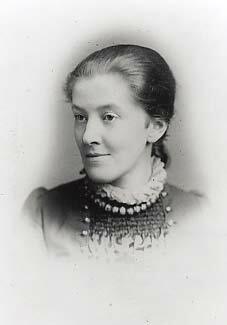 Edwards eventually returned home to England, but she was much changed. She self-educated herself in hieroglyphics (Adams 2010:34), becoming a well-respected expert in the language being sent samples from all over for verification. Edwards took great care in obtaining facts, made serious efforts in her research and self-education which set her apart from the other writers whose approach was much less informed and more sensational (Adams 2010: 36, Lesko). She also created the Egypt Exploration Fund in 1882 with Reginald Stuart Poole and Sir Erasmus Wilson (Adams 2010:36, Wiki). Edwards and Poole were the honorary secretaries (Wiki). Edwards took an early interest in one William Matthew Flinders Petrie, funding much of his work in Egypt. She often transcribed his notes for him on top of monitoring all of the publications and fundraising for the her Fund, and dealing with the early diva’s of the archaeological world (Adams 2010:35). Flinders Petrie would go on to be known as the father of modern archaeology, due to no little part to Edwards, no doubt. Edwards spent a great deal of time dealing with the mail, publications, and promotion of the Fund, to the point of depleting her own funds, and ruining her health. Though she was easily as educated as the men she was helping craft the careers of, she received little respect. So, she hatched a new plan for the final phase of her life. Along with her new traveling companion, one Kate Bradbury, she launched herself into a wildly Ambitious speaking tour of America in 1889 (Adams 2010:37). She was well received. Over 200 organizations invited to come speak, including learned societies and major universities on the East Coast, the Midwest, as well as influential groups such as the New England Women’s Press Association. Edwards expertise as well as her speaking ability, humor and gracious personality made her a favorite among her American counterparts. She was awarded three honorary degrees from Columbia University, Smith College, and the College of the Sisters of Bethany in Topeka, Kansas during her tour (Adams 2010:38, Lesko). The content of these lectures was later published under the title Pharaohs, Fellahs, and Explorers. In April of 1892 Edwards succumb to complications due to exhaustion and a suppressed immunity due to her battle with breast cancer. On her death, Edwards stipulated that her library of over 3000 books, her private collection, engravings and sketches along with 5,000 pounds go to support the Edwards Chair of Egyptology at the University Collage of London and made clear that the one appointed to the prestigious position would be William Matthew Flinders Petrie (Adams 2010:38). An early Suffragette (Lesko, Wiki) Edwards made sure that her contribution would go to a college that Edwards had a long record of extremely liberal opinions and beliefs. She certainly was in favor of rights for women and left her money only to a school which accepted women students. Her will stipulated not only that the professorship must go to someone under the age of 40 but that no one at the British Museum must be considered for it. In this way she assured that her candidate Petrie would be the first Edwards Professor of Egyptology. He, of course, went on to become the greatest name in the history of archaeology, a credit to his patron’s foresight and support (Lesko). Amelia Edwards was a vibrant woman with a great love of Egypt and archaeology. She was a gifted writer and speaker, using her skills make her passions accessible to the public. You can see her as an early crusader for the preservation of archaeological treasures and surly she pushed for the refinement of archaeological methods. She was such a colorful character that she inspired the main character in Elizabeth Peters archaeologically themed Amelia Peabody mystery series (which I highly recommend reading). When I was pursuing my PhD in the Egyptology Department in the Institute of Archaeology at University College London (not University College of London as written above), nearly every antiquarian and older book I used was from Amelia Edwards’s library, as mentioned above. Of course a large number of them were from the Egypt Exploration Fund (now Society) excavations, but there were many others. Those books are still being used today, a great legacy from Amelia.